The Clarke County Hospital Outpatient Services provides appointments for chemotherapy, therapeutic phlebotomies, parenteral injections, infusions, dressing changes, catheter changes, PICC line insertions and other independent nursing therapies. To search a complete list of our specialists click here. Work-related injuries often require specialized rehabilitation to get employees back to work as quickly and safely as possible. Our physical and occupational therapy staff focus on educating patients on proper body mechanics and ergonomics while performing functional work-simulation activities needed for their specific job. Clarke County Hospital's WorkWell program offers prework screen through the use of a functional job analysis. In addition, we also offer functional capacity evaluation to assess your employee's ability to meet the physical requirements for returning to work post injury. 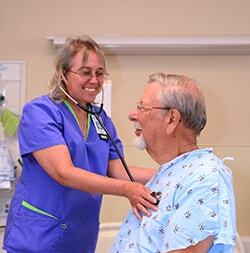 Clarke County Hospital provides 24-hour treatment for work-related injuries and illnesses. If Occupational Medicine is closed, CCH's Emergency Department will treat your employee and ensure all the information is shared with Occupational Medicine.